Winter is a brilliant time of year to admire bark on trees and Prunus sp can be some of the best. P.serrula with its polished mahogany bark is certainly a true gem of the speices but there’s another one that also maybe should be pushing for that crown and that’s the rare and sort after P. Himalaica! This tree has the darkest colour bark of any tree I have had the delight to see growing in our gardens. The red-brown colour is almost black in places and does tend to peel more than other Prunus as well. It makes a small tree that would be ideal for small gardens, it tends to be multi stemmed tree with soft hairy leaves. The flowers aren’t particularly stunning, pale and borne in the spring. It will grow in most soils and loves a bit of sun. It was only discovered in 1965 by Tony Schilling while plant hunting in the Langtang Valley, Nepal and then grown from seed in the U.K. Tony Schilling is one of the great modern plant hunters, who has introduced many great plants into the modern garden. I first discovered P.himalaica growing at RHS Wisley growing on Battleston Hill, The Sir Hillier Gardens also do list it on the plant search tool they have. It’s well worth visiting either garden and see this beautiful tree growing, my photos don’t give enough justice to the tree itself. 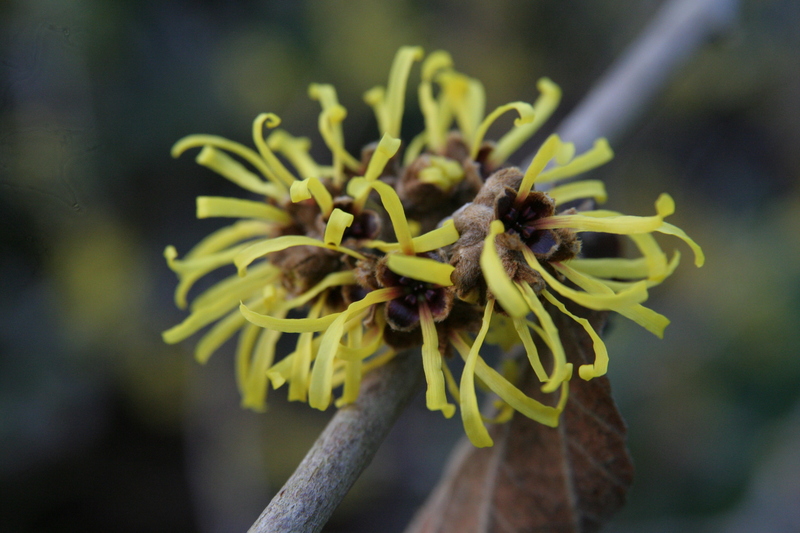 Chimonathus praecox or wintersweet/ice flower orginates from China and was introduced as far back as 1766. It is a member of Calycanthacea, its the Chinese arm of the mainly North American based family. There’s 6 members of the family but only 1 is really widely grown within our gardens. They can be found from most good suppliers and can be found in most bigger gardens although there’s a great specimen at RHS Wisley. All my working life, I have only ever used 1 make of secateurs and indeed many many pairs of a famous Swiss make. It would take something special to move away from them. My secateurs are my most used bit of kit and I look after them like my life depends on them (well my livelihood does!) it was going to be something special to take the place of them, many have tried but to be honest just aren’t good enough for me, the way I use them and the way they cut, they have all just felt wrong. Then I picked up these bad boys! From the moment I picked them up, the quality just oozes out of them, they came in a very attractive Japanese box, wrapped carefully in greaseproof paper, it almost felt like Christmas, once out of the box, they felt so comfortable in my hand with the plastic coated handles helped to move them around in my hand which again is important. I hold my secateurs both on the handles and also more towards the blade, just so the blade is poking up out of my hands, I found switching them around in the different positions very easy. The catch was an initial concern for me, being on the bottom of the secateurs and pretty chunky, but after a couple of goes found it easy to close by using my body to push it back shut and just flicking the catch off. Only downside is sometimes you can accidently flick it across whilst using them and stops the secateurs from cutting fully but that’s just a minor thing that you learn to watch out for. One major advantage of the catch has to the ease you can pull it out of the holster! No trying to grab the handle and sliding over the place with wet gloved hands, just finger in the catch and pull, bingo out they come! Quality of the cut for me is the most important thing, I am a stickler for having a nice clean cut, after all we are preforming surgery on the plants and we would hate it if the surgeon left horrible jagged cuts on us wouldn’t we. These from day one produced brilliant sharp cuts on wood up to 20mm thick with ease. No straining on my wrists either. The sharpness is another thing I obsess about, they have to be sharp, normally my days pruning starts with a 1-minute touch-up but on with these secateurs, in 4 months of use, I have touched them twice after they failed the razor sharp test. That is with some serous use as well. The Japanese Yasuki YCS-3 high carbon steel really produces a blade that holds it edge and is easy to maintain that sharp edge. Indeed, the couple of times I have touched them up took be about 30 seconds to get them back to the sharpness I require. They have also never worked loose during the time I have used them and have never needed any tightening up during the working day. The length is slightly longer than my old Swiss made pair at 20cm (8”) but I found it didn’t really make a major difference to me. The slight weight reduction from the secateurs being made from single piece of metal, did however make a slight difference after a day of using them all day and I have felt a slight reduction in fatigue in my hands. The only things I have noticed is that during the working day, they need a little bit of oil (camellia oil if possible) added to them to stop a little squeaking and without any rubber cushions they do make a chunk sound when the 2 blades meet. After a few days I didn’t really notice the clunk to be honest and it does make it sound like you are hard at work! You can buy them from www.niwaki.com where they are priced at £79.00.They do come with a spare spring as well as a stunning box! Hello and welcome to my new Blog Site! I have moved to this one as the software on my old site just wasnt that user friendly and was taking me ages to write and set my blogs. Hopefully it will make it easier for you all to enjoy as well follow my blogs as I update them as well. Theres also a better category area, diary for my up and coming talks and my twitter feed. Would love to hear any feedback, postive or negative!